Wine weekend at Tillet Gardens and Pistarckle Theater. 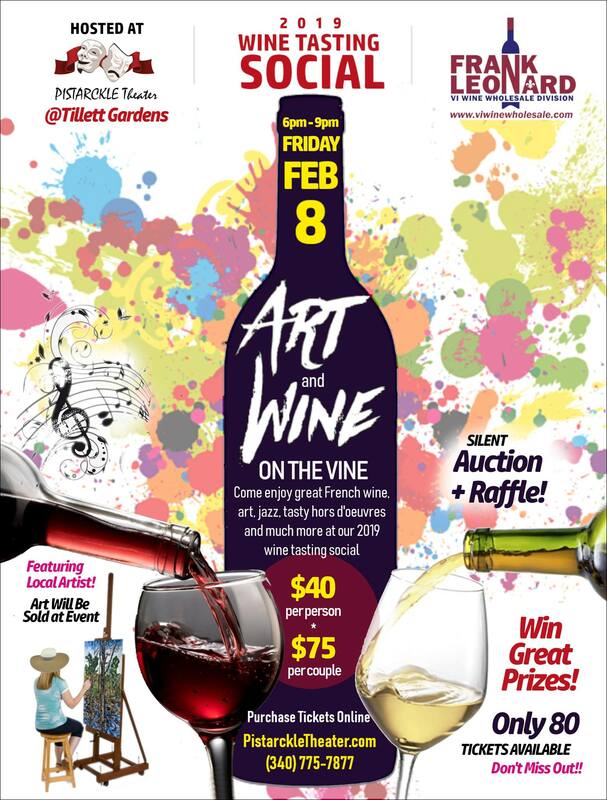 Friday February 8th is the Art and Wine on the Vine event. The Wine Tasting Social inside the theater features jazz, food, art and wine from Frank Leonard VI Wine Wholesale Division. There will be a raffle, prizes, an auction, and preview of Pistarckle Theater’s upcoming musical. A portion of the proceeds benefit the Pistarckle Youth Enrichment and Education Programs. Limited tickets are available online at pistarckletheater.com or call (340) 775-7877. Performances for the popular musical ‘Evita,’ featuring a talented cast of island resident actors, begins on Friday, February 15th and run through Saturday, March 2.